The Lone Pine High School boys basketball team notched win number 20 Wednesday night with a 65-43 victory over the Mammoth Huskies. The win moves Lone Pine’s overall record to 20-2 and a perfect 11-0 in Desert Mountain League play. Ryan Cappello continues his magical season with 25 points, 12 rebounds, 6 assists, and 6 blocks. Garrett Sullivan also continues to stuff the stat columns with 19 points, 4 rebounds, 5 assists, and three blocked shots. Adrian Gonzalez added 8 points and 4 steals. Bryce Scott chipped in with 6 points, Kishan Bhakta 3 points 4 rebounds, and Coltan Martin and Eddy Ivey each had 2 points. Lone Pine picked up the win playing without injured center Brad Greene. Coach Scott Kemp is hoping to have Greene back next week. Lone Pine returns to action Friday hosting Boron. 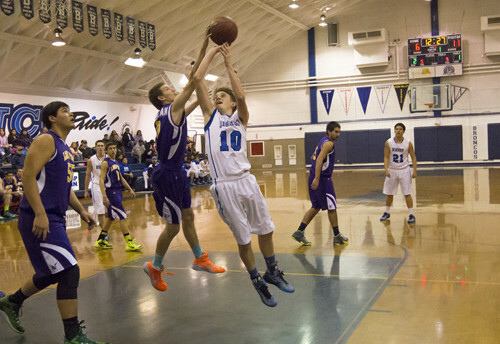 The Mammoth Huskies were led by Mario Rios with 22 points and Christian Orrick added 6. On Monday the Golden Eagle girls topped Vasquez 39-24.